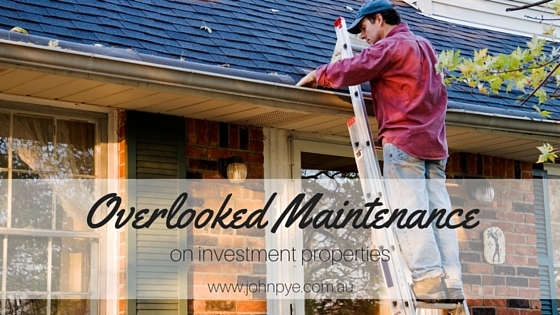 Whilst maintenance on investment properties centre on immediate matters such as leaking taps and toilets, repairs to ovens and hot water systems, we have found that there are many hidden repairs that investors should be aware of and budget for. In homes and townhouses, the maintenance of gutters and downpipes are often an issue. Many investors feel that this work falls into the domain of the “tenant should do it”. This work, for a variety of reasons cannot be put upon the tenant to do. Firstly, at the start of the tenancy it should be made clear to the tenant that should there be any build-up of debris in the gutters and downpipes, you are to be notified promptly. By requiring or expecting your tenant to clear the gutters, an insurance issue is created for you in the event of an accident. We suggest that on a quarterly basis you arrange to have the gutters and down pipes checked and cleared of any debris which could block the gutters and cause water damage during heavy rainfall or create a fire hazard. Take the time to investigate this often overlooked maintenance issue as it could save you money in the long run.